This level is again with ingredients requirement and one of hard level of dreamworld. 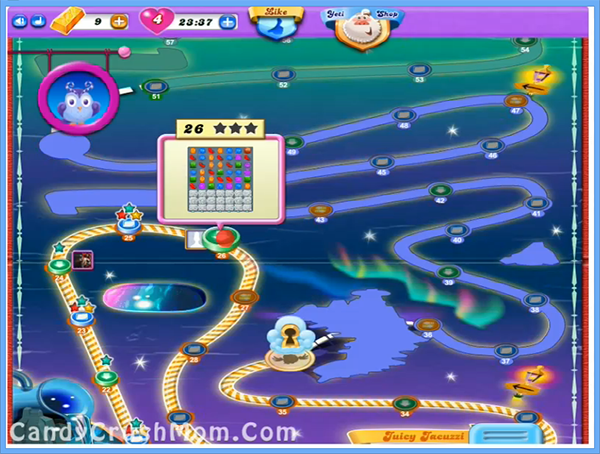 This level board have 41 candies with 26 meringue blocks. To complete this level you must need to break meringue blocks first so ingredients wont stuck on it and then try to make special candies or increase moon power by breaking candies that Odus owl have. You might need to bring down first three ingredients then last one will appear and to take last one down you should use moon power or special candy if you are out of moves. We completed this level with 126760 score luckily in last move by using special candies and moon power that help us to get four colorbombs plus make three star score.